Designed for maximum durability, this outdoor bistro table was constructed from weather-resistant, rust-proof wrought iron. 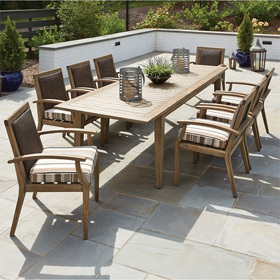 The table features a striking pattern metal top with a concentric circle motif and a unique cylindrical base which will be a natural fit for any modern patio space or outdoor dining arrangement. 30"L x 30"W x 29"H 37 lbs.